Loved the room and awesome view. We are glad to hear that you and your family enjoyed our spacious condo with a fantastic view. Thank you for sharing your experience with us. I am pleased to hear that you and your family had a great time in 7123. The condo as you mentioned is very spacious and it has everything you need. Robin is great! and he makes sure everyone at Xaman ha has a great time by the pool. Being an ocean front condo gives you amazing sunrises and great star watching at nights. We hope to have you and your family back soon! Our first time staying in Xaman Ha Condo (unit 7123) and we absolutely loved it! We have been traveling to Mexico for over 10 years and PlayaCar is hands down our favorite place with the nicest beaches. The location of these condos can't be beat- easy 2 block walk to everything you could possibly want or need. Rentals Your Way was very easy to work with and allowed us early check-in and late check outs. They were very prompt with reservations and any questions we had before and during our stay. The unit itself was very clean and suited our needs perfectly. The appliances, hot water and air conditioning all worked well. There were a lot of steps but as other reviews state- there is a new enterence with an exterior paved walkway under construction that can eliminate some of the up and down parts of the interior hallway. House cleaning came every other day and were the nicest ladies ever- very sweet! It was kind of strange that we never had washcloths or hand towels provided in the bathrooms- next time I will pack some. There were a ton of beach towels and bath towels. My only suggestion for improvement would be to update the living room furniture and the kitchen bar stools. While comfortable- the couches were a little stained and the wooden bar stools were so worn they looked terrible. When comparing to other units- the furniture here really lacks appeal. We did find the bed in the master bedroom to be very comfy and slept like a rock every night. Overall- the incredible views and the vaulted ceilings outweighed the ugly furniture for us. We would most definitely rent this unit again in a heart beat! Last I would like to mention a few of the owners and regulars that we met and really enjoyed talking with- they gave us great advice on places to go and were just so friendly and welcoming: Robin and Robert, Darrel, Deckland, Terry, Roger and bartender Robin- Thanks for the laughs! Thank you for your comments. Everyone at Rentals Your Way and Caribbean Beach Properties works very hard to keep our guests happy. We try to make our condos your home away from home. I am glad you met some of the owners and made friends with our guests , we hope that like them you keep coming back to enjoy everything that Xaman Ha and Playa have to offer. I will pass on your comments about the furniture to our owners so they can have that taken care of. We look forward to your return soon! Great unit and location, although we wish the tree (don't know what type but not the palm trees) in front of our condo was not there. If only the palm trees, the view would be outstanding, framed just like a post card. And yes, the up and down of the stairs and walkways are a bit confusing at first and seem like a long way around the bend, so to speak. Weird configuration. Aw well.... The unit is nicely appointed. Two drawbacks: 1) The front door and a few windows (especially in the front larger bedroom) are not sealed properly. They ask that you not run your a/c unit when gone but if they were properly sealed they wouldn't need to worry about expensive electric bills. Plus, the construction from the very large condo units going up next to Xaman Ha would not be so loud. Luckily we were not in the condo much during the day. 2) The pool bar was closed for renovations before the big tourist season and we were not informed of this before arriving. While not a major inconvenience, we came in later on the first night and wanted to grab food and drinks from there, but alas we had to go out to dinner. And we wanted to utilize the pool bar during our stay and could not. Missed revenue on their part. However, the unit is quite nice, the grounds are well kept and the beach and pool are wonderful. We would definitely go back again. I am glad that despite some minor details you and your family were able to enjoy 7123 as well as Xaman ha. I have passed the condo details to the management company so they can resolve them. As far as the pool bar it is part of Xaman ha administration and it has been their decision to close during the months of Sept and Oct. We look forward to having you stay with us soon! 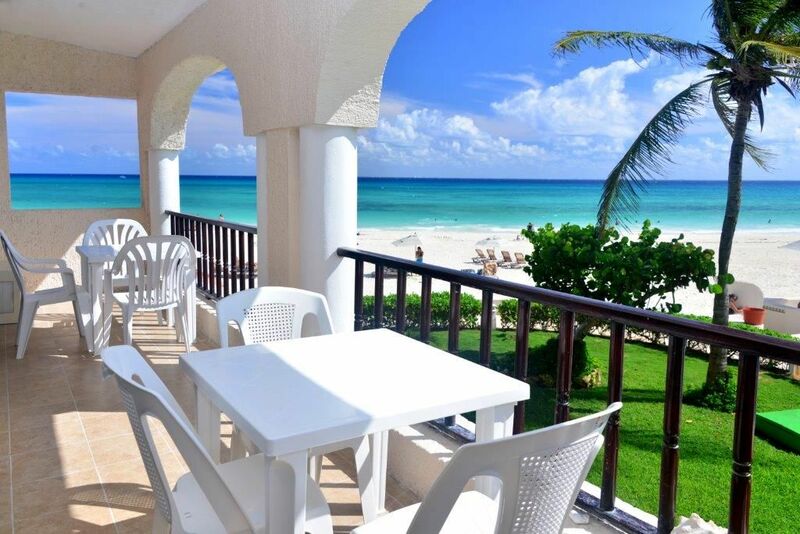 We booked this beachfront, 3-bedroom condo thru Rentals Your Way for the week of Sep 25 - Sep 30. The booking process and all communications with Sarai were so easy and stress free. Unit 7123 is at the end of a second floor hallway. it is the end closest to the beach so our view was amazing. The terrace can be accessed from the master bedroom as well as from the living room and looks out onto the pool and beach. The place is super clean, spacious, and beautifully decorated. It has everything we needed for a family of 6 adults and 2 toddlers. towels, tp, paper towels, dish and laundry detergent, washer and dryer, iron with board, full kitchen, shampoo and conditioner, even board games and pool and beach toys. The AC worked wonderfully and there was always plenty of hot water. Everything is walking distance from the condo complex. So many restaurants and bars, banks and money exchange places, the ferry to Cozumel, and the main little plaza where you can see Mayan dancers and los Voladores de Papantla every night. Also the Mayan Portal is there. But you are still away from the hustle and bustle and noise of the city. We slept soundly every night. there is construction going on next door at the Playacar Palace during the day. the noise never woke us or even bothered us when we hung out at the pool. Speaking of the pool area, it was always clean and the water was perfect temperature. It is low season, so there were always plenty of loungers available, but the pool bar was closed. Our condo was cleaned twice and fresh towels provided during our week stay. All in all, it was a wonderful week. I will definitely book at Xaman Ha again. I highly recommend it. Rocio, Thank you so much for your wonderful feed back! 7123 is a wonderful corner unit with a spectacular view. Xaman ha is currently working on new staircases to make the condo accessible for everyone. I will pass on your comments to our staff as we all work very hard to make sure our guests have an unforgettable vacation. We look forward to your return!!" best wishes Sarai. Great 3 bedroom condo with veranda right above the beach and pool. Very clean condo and friendly staff. Perfect location for walks to town and a ferry to Cozumel. The beach is white soft sand with turquoise colored water. Post card picture perfect. The pool is great as is Robin the bartender/chef. Its also right on the beach. Not crowded like the all inclusives so it is very family friendly. Would recommend to anyone going to Playa Del Carmen that likes a kitchen to prepare their own food with short walks to town for meals and entertainment and is not looking for a crowded all inclusive resort. Great place. Our best vacation ever according to my wife and kids. I'm so glad to hear you had such a great stay in Xaman Ha 7123!! This unit is a gem!! Great views, best location in the complex plus best amenities!! As you mentioned not having the crowd in front of you is unbeatable.. and being able to cook what you want when you want is so handy!! This complex has the best beach in Playa del Carmen!! Please Mike, let us know if you plan to come in the future we will be more than happy to offer you a return customer discount. By the way The Xaman Ha complex has just added a new entrance to the building, roughly halving the number of stairs needed to reach several units including 7123.